Keil MDK provides software developers working with XMC1000 and XMC4000 devices with a professional tool suite for embedded applications. Keil MDK is the most comprehensive software development system for ARM processor-based microcontroller applications. MDK Version 5 includes the ARM C/C++ Compiler, the CMSIS-RTOS RTX Kernel, and the µVision IDE/Debugger. The XMC1000 and XMC4000 peripherals are configured through Infineon DAVE™ and the setup is exported to MDK using a generated Software Pack. Note: The Infineon XMC1000 Edition is no longer available. 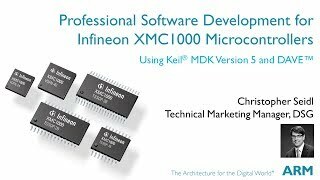 To develop software for Infineon XMC1000 microcontrollers, we recommended Keil MDK Cortex-M Edition. For the XMC4000 series, Keil MDK Professional Edition includes fully supported middleware components for networking, USB, file system and graphical user interfaces. MDK Infineon XMC1000 Edition is a free-to-use software development system, that supports the ARM Cortex-M0 processor-based Infineon XMC1000 microcontroller family. Sophisticated peripherals are configured with the popular Infineon DAVE™ development platform. DAVE generates a Software Pack that integrates with MDK and accelerates software development with building blocks for a wide range of application use cases. Infineon XMC1000 Starter Kits provide on-board debug hardware that connects via USB to the µVision Debugger. Run the downloaded MDK5xx.exe installer. Install to any path you like. If you have existing MDK-ARM installations that you want to keep, select a new folder for MDK v5. In case you install MDK Version 5 into the folder of a Version 4 it is recommended that you also install the legacy support. During Setup the the Software Pack Manager is launched automatically. Click Install to download and install the XMC1000 Device Family Pack supplied by Infineon. MDK Version 5 is now ready to use. Launch µVision5 to start component-based projects. Login with an account that has administration rights. Right-click the µVision icon and select Run as Administrator... from the context menu. Open the dialog File — License Management... and select the Single-User License tab. Click the button Get LIC via Internet..., then click the button OK to register the product. This action opens the License Management page on the Keil web site. Enter the Product Serial Number you purchased along with your contact information and click the button Submit. An e-mail is sent back with the License ID Code (LIC) within a few minutes. To activate the Software Product, enter the LIC in the field New License ID Code (LIC) of the dialog License Management... and click Add LIC. Application Note 258 demonstrates how to use DAVE3 and MDK Version 5 to accelerate the development cycle when creating applications for Infineon's XMC industrial microcontroller families. Using both tools together will give you an easy-to-use development flow. It combines DAVE's powerful configuration tools and Apps library with µVision's project management, debug capabilities, and the ARM C/C++ compiler. Application Note 260 is a hands-on lab that demonstrates various examples with the Infineon XMC1100 Cortex-M0 processor and Version 5.10 of the Keil MDK-ARM tools. The Keil Blinky, RTX RTOS and DSP examples may be downloaded alongside. All examples are compliant to Cortex Microcontroller Software Interface Standard (CMSIS v2.0). Procedures for building "bare metal" and RTX projects using Infineon's DAVE Development Platform are also included. Application Note 263 is a hands-on lab that demonstrates various examples with the Infineon XMC1200 Cortex-M0 processor and at least Version 5.10 of the Keil MDK-ARM tools. The Keil Blinky, RTX RTOS and DSP examples may be downloaded from this web page using the link below. All examples are compliant to Cortex Microcontroller Software Interface Standard (CMSIS v4.1). Procedures for building "bare metal" and RTX projects using Infineon's DAVE Development Platform are also included. An Infineon XMC1200 Boot Kit board and USB A to miniB cable are required. Open the PackInstaller from the µVision5 toolbar. Switch to the Examples tab. From the list of available example select the example you want to install. The Devices tab allows to filter for specific devices or device series. When pressing Copy a dialog box will ask for the desired destination. The example will be directly installed into this folder. Folders that do not exist will be created automatically. Tick Launch µVision to open the project after installation.